ClemenGold, it says, has fast become the latest popular ingredient in a variety of food and juice products, and SIR JUICE is proud to be an official partner of this global brand in South Africa. With a production process (no details available) that means the end product contains as much of the natural flavour and goodness of the whole fruit, SIR JUICE ensures that each of their juice drinks is as close to the original fruit as possible. ClemenGold is a delicious sweet and aromatic soft citrus fruit, with only the best of the crop picked and packed by hand. Hand-picked by selected growers from across South Africa, it is considered to be citrus at its best. Great pride is taken in nurturing young seedlings until the fruit is fragrantly ripe and ready to eat. 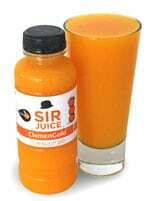 ClemenGold from SIR JUICE is available workplaces, coffee shops, Delis and restaurants across South Africa.